If one word was needed to sum up the direction football has gone in, especially in terms of the crazy finances and money leaking from the sport, it would be agents. Back in April, the latest figures were revealed, which showed the total amount of agents fees paid by Newcastle United over the past 12 months, along with the other 19 Premier League clubs at the time. The decision was made a while ago by the authorities that all agents fees paid by top English clubs had to be made public in the need for transparency. The figures released in April 2018 were for the period covering two transfer windows (Summer 2017 and January 2018) and represented all intermediary and agents fees paid by clubs during the specified period via the FA’s clearing account. Remember, this is money paid to the middle men that is not just necessarily when buying players, plenty of clubs using agents to help sell players as well, plus agents often paid by clubs as well when contract extensions are agreed. Thursday though has brought an exclusive from The Times, revealing that the 20 current Premier League clubs were meeting today and are pushing for a ban on clubs paying agents. An investigation by The Times revealed that four out of every five deals in the Premier League last season involved the same agent being paid by player and club. The Premier League want to insist that only players should pay agents, to reduce the power of intermediaries. Today’s Times exclusive also revealed that HM Revenue & Customs (HMRC) are looking at these dual-representation arrangements and will be demanding that clubs and agents provide evidence of what has been done for each side. 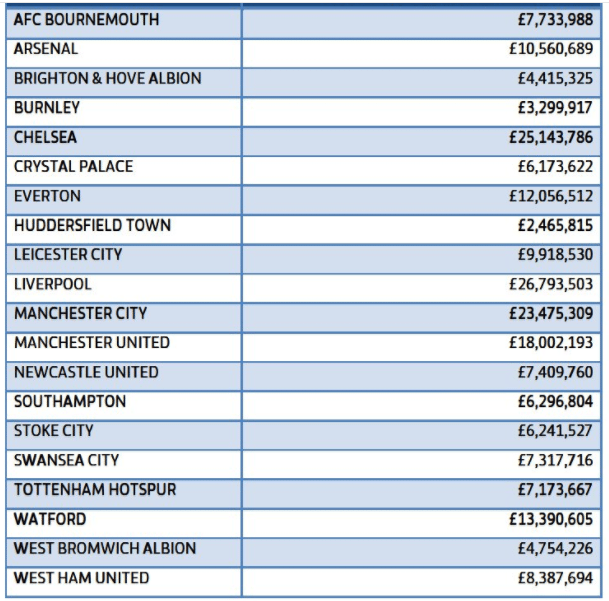 Last season Premier League clubs paid agents a total of £211m (club by club breakdown above) last year, which was an increase of £37m on the previous 12 months. There were 541 player transactions (transfers, loans or new contracts) involving Premier League clubs last season with a minimum of at least 426 of these, 79%, involving dual representation. There was also at least one deal last season where it was triple representation, an agent paid by player, buying club and the selling one! This was the situation two years ago when Paul Pogba signed for Manchester United, his agent pocketing an absolutely shocking £41m from that single deal. As you can see, Manchester City had a full house of 52 out of 52, both they and the player paying the agent. West Ham had the lowest proportion, 9 out of 29 deals involving dual representation, whilst Newcastle United were second lowest – 12 out of 21. Whilst Mike Ashley is by far our overwhelming local (to Newcastle United) problem, it would be great if limits can be put on agents finally.